April 7, 2017 was a banner day for the US2020 RTP program, The Frontier, and the Research Triangle Park as a whole. 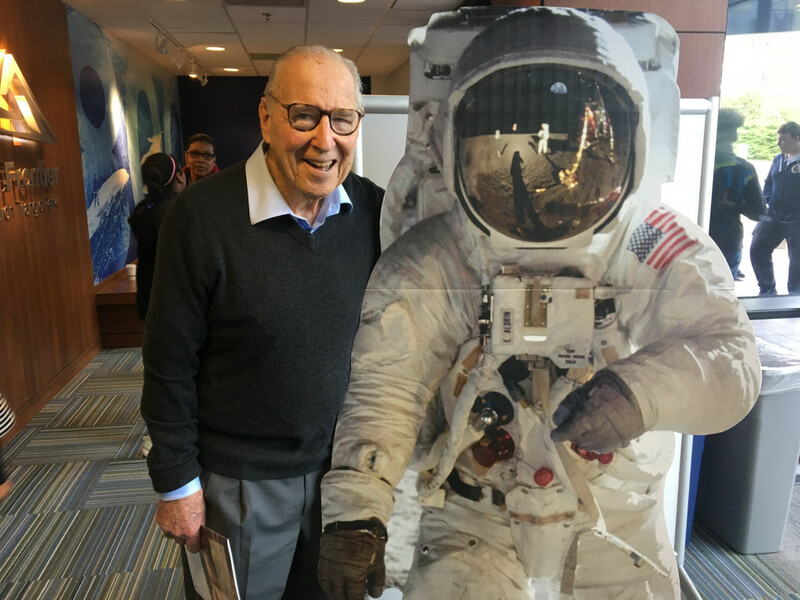 Aside from convening another successful STEM Expo (the US2020 program’s 5th in just under two years), we hosted an American treasure – Captain James Lovell. The night before, Captain Lovell had kicked off the annual North Carolina Science Festival with an engaging talk at Morehead Planetarium. Our friends at Morehead reached out to us to see if we would be interested in hosting Captain Lovell for a breakfast the morning of our Expo, to which we excitedly obliged. Trying to explain the importance and significance of a man like Jim Lovell to younger generations can be fairly challenging. Admittedly, if not for the movie Apollo 13, I hardly would know the man. For those too young to have seen the film (which was released in the summer of 1995), chances are the first thing I heard when I mentioned to them that he was coming was, “who is James Lovell?” The former history teacher in me excites at such a prospect, and I enjoyed telling all who wondered as much the great story of the man who solved one of science’s greatest challenges… and made history along the way. Captain Lovell and his team were presented with an amazing challenge in a very unforgiving environment. Quite simply, failure meant death. On their way to the moon, where they were to be the third crew to land and walk on our gravitational sibling, two of the three fuel supplies aboard the ship were damaged and made unusable by an explosion. The crew went from hopeful to do something that few had done before to desperate to save their lives and return to their own terrestrial body. Using incredible ingenuity, Captain Lovell, his crew, and the team back on Earth defied the tremendous odds against them and ‘hacked’ their way out of the harrowing situation. The irony of his coming on the day we hosted hundreds of adult volunteers and many more hundreds of students was not lost on me. Here we were, extending the core mission of our program in the greatest way we could, by exposing the attending students to dozens of different branches of STEM in a four hour period of time. The variety of offerings at these events is truly impressive. There is no shortage of content across the STEM fields in our very fortunate region. In the end, we hope these students will be inspired by what they see and experience at these events – that a spark will be lit that will keep them on a path towards a creative and innovate career. We want to see them become the problem solvers of tomorrow, addressing challenging issues and helping to make the world a better place. Little did they know as they filed in that morning that an 89 year old legend would be walking right by them, on his way to the airport to return home to his wife after a quick visit to the Triangle. As we escorted him out, I brought him up to cardboard cutout we have had at The Frontier since its opening – it is of his Gemini 12 crewmate Edwin “Buzz” Aldrin. When he saw the cutout, he gave a good chuckle – one that expressed a humorous joy that only 50 years of friendship could produce. I asked if he would be willing to stand for a picture with his old friend. Lucky for us, he did. It was a moment I’ll never forget. Many thanks to you, Captain Lovell, for unknowingly inspiring many generations of problem solvers, both past and future. As we celebrate 47 years since that fateful day, I remain hopeful that we’re just getting started in that important work… now more than ever.